Unprecedented numbers of asylum-seekers are risking their lives crossing miles of snow and windswept winter-brown prairie for the chance to file their claims in Canada. Fearing deportation from the U.S., more and more people are packing up and heading to Canada. However, only those who cross the border illegally will ever get the chance to have their asylum claims heard. 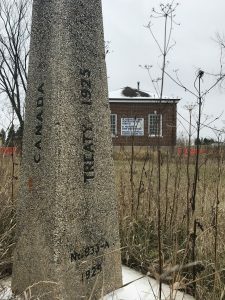 Canada and the U.S. have a Safe Third Party Agreement, which mandates that asylees must make their claims in the first safe country they arrive in. Those who try to enter Canada at official ports of entry will be rebuffed by border control and often arrested in the U.S.. The vital tasks of apprehending and providing medical care to these asylum-seekers has fallen to tiny border towns like Emerson, population 350. 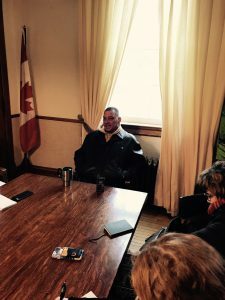 We drove out to meet Reeve Greg Janzen, whose municipality encompasses six small towns including Emerson, at Emerson’ courthouse. Inside town limits, we were close enough to the U.S. that my phone was picking up American cell signals. According to the Reeve, this influx of newcomers has already consumed 30% of the municipality’s annual budget, and all of the town’s first responders have full-time day jobs: “It can get taxing. Janzen made a point of calling the asylum-seekers “border jumpers” to distinguish them from refugees resettled in Canada through government approval or private sponsorship. “There’s a big difference,” he added, “As far as I’m concerned, they’re already in a good country,” a sentiment that echoes the Safe Third Country Agreement. According to Janzen, irregular crossings escalated dramatically earlier this year, from 19 in January to 145 in February before peaking at 170 in March. Many asylum-seekers are underdressed for the weather, sometimes fatally: in May, a woman died of hypothermia a few miles from the border trying to make the crossing during a particularly nasty rainstorm. In extremely cold weather, cell phones can’t hold a charge, leaving asylum-seekers without a way to call for help. Many, seeking shelter from the biting cold, started knocking on random doors, frightening residents and creating security concerns. Janzen recalled a particularly startling incident, when three young men, desperate for shelter, pushed their way into a house in which a woman was home alone with her three children.